The Castle Hotel– an enchanting and magical experience within the heart of Orlando – invites guests to enjoy luxurious accommodations while amazing their imagination with Wizarding Wonders at The Castle Hotel. From June 1 – July 31, 2011, starting at $144 per night, guests of The Castle enhance their wizard experience with two-night accommodations, theme park transportation to a mysterious world, Castle Creature stuffed toy, magical potion beverages, “dive-in” large screen movie marathon beside the pool and movie tickets for the entire family to enjoy the eighth and final movie installment released July 15, starring Daniel Radcliffe and Emma Watson. Perfect timing for the huge final release of the on-screen version of J.K. Rowling’s enchanting saga, The Castle Hotel brings the magical experience from the parks and activities right back to the comfortable hotel room. Located in the heart of Orlando, on the famed International Drive, the royal experience awaits guests as The Castle combines artistic flare and playful luxury within its medieval-inspired walls. From the rare doll collection and castle creatures to the medieval architecture and authentic Austrian castle detailing, The Castle creates an atmosphere both parents and children are sure to love. The Castle Hotel has a prime location in the theme park capital of the world, providing hotel guests with plenty of options for family fun, quality time with friends or a romantic escape. International Drive and Mall at Millenia offer a multitude of shopping, dining and nightlife opportunities, while Orlando’s famed theme parks are only a few miles away on the hotel shuttle service. 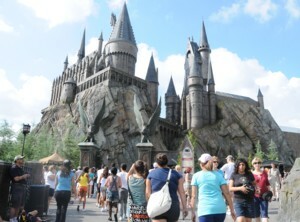 For more information or to book the Wizarding Wonders package at the Holiday Inn Resort Orlando – The Castle, please visit www.thecastleorlando.com or call 407-345-1511 or toll-free 877.317.5753.